Now we’re moving on to the WHY and HOW of fighting fair. Why is it important to learn to fight effectively in your marriage? Because, being human, you and your spouse will never agree on everything. Because your marriage, easy or hard, young or old, is a holy matter in the sight of the Lord. Because your marriage should reflect the truth of Christ and the Church, and be a testimony to the agape love of the Father. Because your children will learn about marriage from you and your spouse. Because your grandchildren will bear that fruit as well. Because God created marriage to be a blessing to you, but also a blessing to society as strong families and strong people are created through strong marriages. Learn to fight well, so you can stay strong, and finish the course proudly. I learned how to fight well with my husband, because – second to my faith – my marriage was the most important thing in my life. I love/loved my husband very much and endured much emotional pain to make it to the 34-year mark. But I also learned to fight well because I loved my children and wanted to give them a picture of true commitment in marriage. My husband and I had many issues to work through in our marriage. But we both chose the marriage over the easy way. I have no regrets. Focus on one topic at a time. No fair bringing up every issue you’ve ever had – the idea is to find solutions one at a time. Focus on solving problems, not changing people. Face it: your spouse will not change unless the Lord changes him/her. You cannot make it happen, and the harder you try to do so, the more stubborn he/she may become. Instead, focus on the problem: dinner responsibilities need to be shared, how do we do this? It may mean lowering your standards (home-cooked meals only five days out of seven – with one fast food or pizza day, and one leftovers day?). It may mean sharing other duties (you cook, I’ll bathe the kids). It may mean letting something go (Tommy can do soccer or karate, but not both so we have time for family meals). Allow for breaks in heated discussions – maybe even scheduling a time and day to pick up the topic again. Not everything has to be solved immediately. This is especially true if things are getting out of hand. If you’re past the point of being reasonable – i.e. you just want to scream, yell, hit, or throw things, leave the room, leave the house if necessary. You’re doing no good to your relationship, and are no longer focused on solving problems. Be willing to compromise. Try to see the situation from the other side, and recognize the validity of what is being said. Once you do that, compromise is easier. You want to be at all the kids’ practices and games; your spouse wants to trade off with a neighbor occasionally. Compromise on taking them to all the games, but trading off with some practices. This might even leave some time for couple time! Learn to let go. Is it really that important that your husband turn his socks right side out before they go into the laundry? Just fold them inside out, and he can turn them right way ‘round when he gets them out to wear. That’s what we do – but I’m the culprit with the inside out socks, and he does most of the laundry! Fighting fair in marriage is a learned skill – one that any committed couple can master. 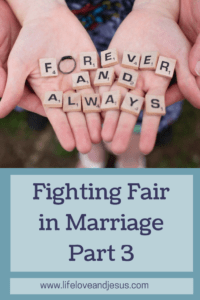 But if your spouse doesn’t cooperate, you can still apply many of these fighting fair principles on your own. For example: Refuse to be baited into an argument at inappropriate times. Keep your love and commitment in the forefront of your mind as you do argue. Remember the HOW guidelines, and implement them yourself, even if your spouse is fighting ugly. Be the adult. It’s hard. Sometimes it feels impossible; sometimes it is impossible. But if you choose the fair road, you’ll be able to look yourself and your kids in the eye without shame. You’ll have done your best. Be sure to check out Part 1 and Part 2 of this series, if you haven’t already! Such an important and helpful series! Thank you for sharing, and for your transparency. One of the biggest lessons I learned in 30 years of marriage is that the areas where my husband is different from me are not weaknesses or character flaws on his part. (Who knew, right?) In reality, his strengths cover my weaknesses, and vice versa. It takes the combined effort, talents, and abilities of both of us to make our marriage work. When we learned to celebrate our differences rather than fighting against them, things really turned around for us. Good advice! Especially the part about leaving when it gets heated, that was validating for me. I grew up with parents who were very loving, but fought with, shall we say, very passionately. My husband grew up where all the conflict was hidden. When we were first married he felt like we should never fight, and I wanted to fight loud. I had to learn to walk away until I could process my emotions. He had to learn to trust that I would come back. Recently it was mentioned to me (not by my husband) that by leaving, I was controlling the situation. That was never my intention, but it made me evaluate my actions. Thank you for putting into words the reason behind my response! Glad you enjoyed the series. I’ve often had to walk away, simply because nothing fruitful was being accomplished. My husband also had to learn to trust that I would come back to the argument, not leaving unfinished business to hang over us. Aww I love this!! It makes me want to go hug my husband! We don’t fight often but I know a big disagreement will arise sometime. I’ve loved reading through this series, thank you for sharing! Excellent post. My husband and I have been married 41 years and we have not been the best of communicater’s. It’s only by grace that we have got this far and we are still learning the art of communication. Thanks for the kind words! I know all about grace in marriage – as, I think, anyone does who has been married long! !